Today, almost everyone has a home office, whether it's used for business, or the running of day-to-day household accounts, or as an entertainment area, the home office has almost become a standard for most people. So, for those who blog about the business of business or the business of living, some free stock photos of stuff you use in the office. The household budget. This photo is a few years old now, so figures have changed quite a bit for most of us (on the upward side), as has the cost of gasoline. In Canada the cost of gasoline over the last few years has fluctuated wildly; not only over the course of time, but we also see this trend weekly. Gas prices during mid-week (Monday afternoons to early Thursday mornings) are considerably lower than gas prices from Thursday noon to Monday mornings. Why? Gas retailers raise prices towards to weekend to catch the travelers on their way to holidays or weekend homes. 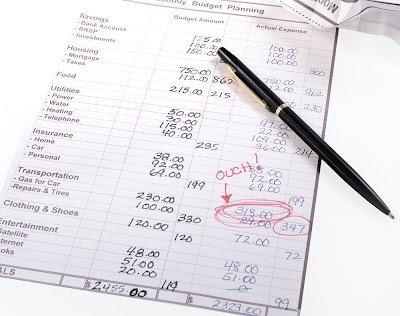 These days, a family budget is a must if one is going to survive the economic crunch. Tracking your budget and spending within it, can save your bacon...or at least leave you enough money to buy some bacon. Another cell phone...actually, it's the same cell phone as the previous picture, this time open and plugged-in to charge it's battery. The screen shows the charging battery and having photographed this photo on a piece of black opaque glass there is a reasonably well defined reflection. Cell phones aren't just for office or business use of course, but today it's definitely a part of many businesses. 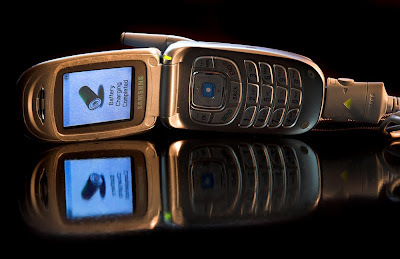 (*NB: This post was written back in 2009, and even then this phone was not the newest thing out there. Mobile devices in 2018 offer much more than just a way to phone someone, including the ability to surf the net, take pictures and videos, can handle video chat and most don't have the fold down screen any longer). Just a few old thumbtacks. Another thing I discovered in my dad's possessions. 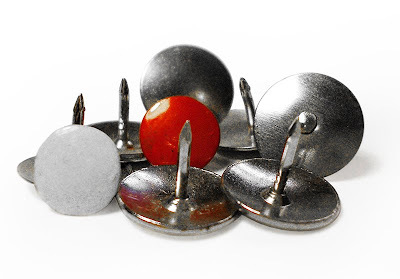 Today, we use "map pins" or plastic headed tacks on our bulletin boards, but these old thumb tacks often had stronger nails than anything we find today. The only problem with these old ones is getting them out. Their flatter heads make them difficult to grasp unless you've got some fingernails. I love this old tape dispenser. It weighs a ton - it could easily kill someone if you threw it at their head. It's very handy for one-handed taping. Today's plastic containers are useless. 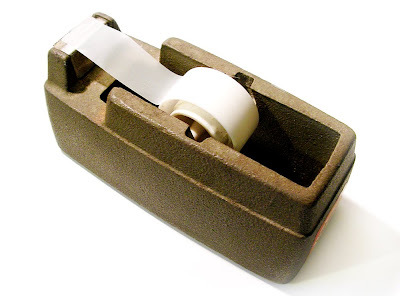 When I buy scotch tape I generally pull those this plastic containers apart and put the roll onto this. It just doesn't move when you try to pull a piece of tape off, so I can hold my paper or object with one had while I grab a piece of tape. Sometimes, there's no improving on the old. 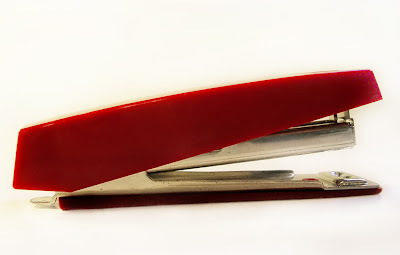 A modern stapler in red. These little staplers in a variety of styles and colours can be purchased at dollar stores. Perfect for a couple of pieces of paper, they aren't much good for larger stapling projects, but for the average home office they do okay. The really good thing about these is their cost. If you lose one, you don't fret over it, just buy another. I have lost (or someone has appropriated) at least three of these in the last four or five months, and for the life of me I can't figure out where they went. Que sera, sera. 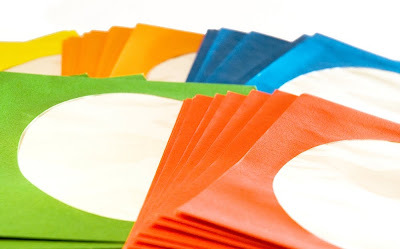 CD or DVD storage sleeves in bright colours with cellophane windows. While CDs are becoming less used because of DVDs and DVD burners, there are still plenty of uses for CDs - mailing a few photos to a friend or relative doesn't take much space, and a CD is perfect for that. I still use CDs for burning music to play in my CD player (um, free music only and mostly gospel/praise type stuff). And I use these covers for storage of my backup images - I burn my raw files to DVD as well as storing them on external hard drives. 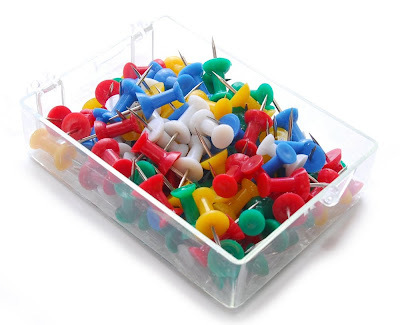 Earlier on in the post I gave you some old thumb tacks, so here's the new "map" or "push" pins. Plastic, colourful but not not very sturdy. Still, they can be good to keep on hand in the office.